What awaits us in Nes Ammim? Berit Hoffmann, Daniel Friesen, Judith Cantu Flores Reimann and Paul Bochynek (L-R) share expectations at the induction seminar. “It was calm, and it was peaceful,” was Daniel Friesen’s impression of New Ammim, located in northern Israel, when he was in the country. 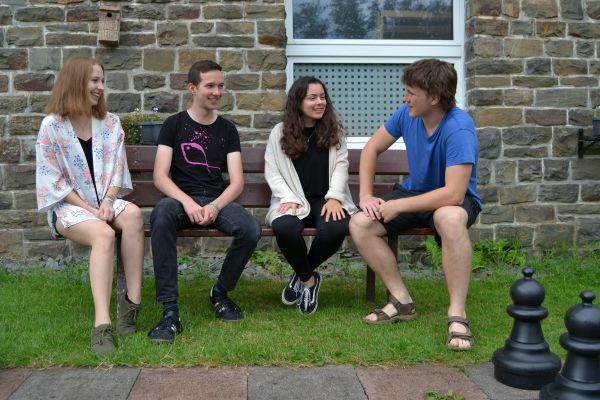 The secondary-school graduate was traveling on a learning tour with Cologne’s Evangelical Church congregation Kartäuserkirche and stayed at the Christian village Nes Ammim’s hotel. “As a guest you can tell that people act as a community here,” says the young Cologne resident. And because this made such a lasting impression on him, he will become a part of this community himself in August and serve as an international youth volunteer in Nes Ammim for a year. This morning Daniel Friesen is talking with other young adults at the Richard-Martin-Haus in Hilchenbach in the Siegerland region who are also planning to serve or who have already served as volunteers in Nes Ammim. They have come together at the conference center with Gerlinde Butzphal, chair of the German Nes Ammim Association, for an induction seminar. The name “Nes Ammim” is Hebrew and means “sign of the peoples”. And this is what the village, founded by Europeans at the beginning of the 1960s as a sign of lived peace work, is intended to be. After the horrors of national socialism this is to be a place of active reconciliation work between Christians and Jews, Europeans and Israelis. Gerlinde Butzphal from the Nes Ammim Association prepares the young people for their voluntary service. 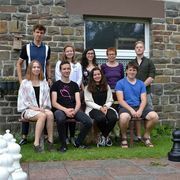 The six new volunteers, who have come to Hilchenbach from all over Germany, don’t know yet exactly which tasks await them. “We will be assigned to either the hotel and hospitality services, technical services, the laundry or the garden after we arrive,” secondary-school graduate Paul Bochynek from Cologne has learned so far at the seminar. The volunteers live and work closely together with their Israeli neighbors, they experience how Jews and Arabs live and what they believe. “It’s a kind of community that is good for us German, individualistic ‘lone warriors’,” thinks Gerlinde Butzphal of the German Nes Ammim Association. For this reason, she also invites retirees and working professionals on sabbatical to Nes Ammim for a shorter term of service. Working together was one of the best parts of her experience in Nes Ammim, explains Berit Hoffmann in Hilchenbach. The psychology student returned from her term of service in Nes Ammim the previous year and is sharing her experiences with the new volunteers. “The community is what I miss the most back here in Germany,” she says. “I liked that we volunteers were basically adopted by an Israeli family; we ate with them and celebrated with them,” adds Judith Cantu Flores Reimann. The young woman from Mülheim on the Ruhr River was also in Nes Ammim last year and has already been back to visit her host family there since her return to Germany. Association chair Gerline Butzphal knows that this is not always easy: “Work conflicts cannot simply be put aside after quitting time in Nes Ammim.” After all, the colleague who always comes late to work will be sitting together with the volunteer at the supper table. Dealing with conflict well is part of the learning process in Nes Ammim – in both the day-to-day and the larger picture: The Nes Ammim Association counts reconciliation between Jews and European Christians after the Holocaust and initiating dialogue and reconciliation processes between Jews and Arabs as its core aims.